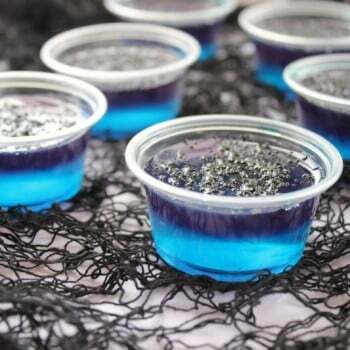 Angel of Death Jello Shots are a heavenly cocktail that goes down dangerously easy! Looking for a way to make your Halloween party a little more fun this year? I’ve got the answer kids and it’s unique jello shots! There are so many way to mix and match the cocktail flavors you love into make ahead party shots. Mix everything together for a classic cocktail look, or layer the colors and flavors for an attention grabbing cocktail everyone will want to throw back! These jello shots may seem harmless enough, but they are totally delicious and go down so easy! 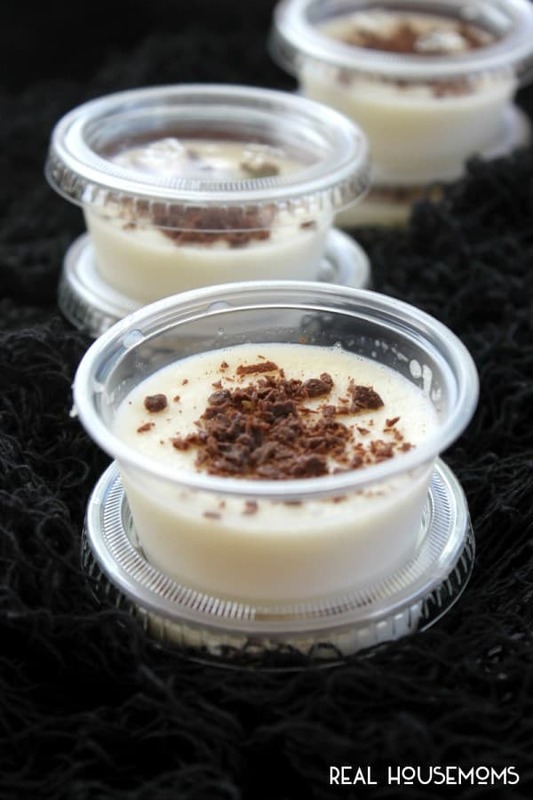 The cake vodka really stands out while the whiped vodka and chocolate give these shots an added richness that’s oh so good. I’m not usually into sweet shots, but these little guys are now on my party must make list. They’re big time crowd pleasers that you’ll want to make a double batch of to keep everyone happy. So get your Halloween on and invite the Angel of Death to your party! Get more great recipes like this one on our Best Drink Recipes pin board! Follow Real Housemoms’s board Best Drink Recipes | RH on Pinterest. Place the plastic cups on a baking sheet or dish for easy transporting. Leave the lids off. Place gelatin in a medium mixing bowl. Pour 1/4 cup cold milk over the gelatin, stir to combine, and then set aside. Heat the remaining 1/2 cup milk in a small saucepan until simmering. Pour the hot milk over the gelatin and whisk to combine until the gelatin is melted. Add the sugar and whisk to dissolve the sugar. Add the cold cream and vodkas, and whisk to combine. Pour the jello mix evenly into each of the plastic cups. 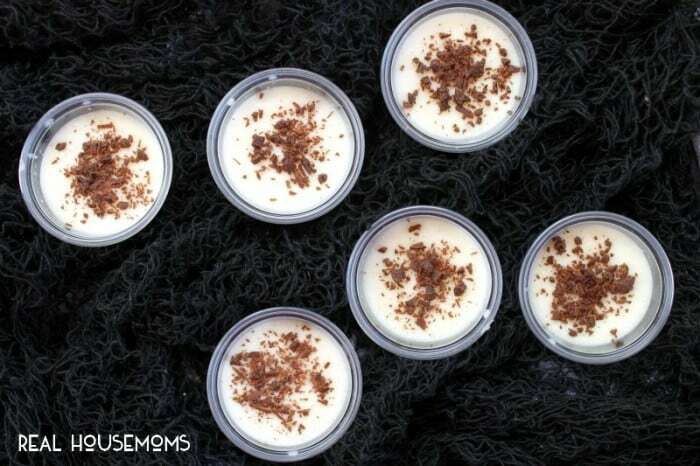 Place the lids on the cups and transfer them to the fridge. Chill the shots until set, at least 1 hour. Once set, remove the shots from the fridge, and take the lids off. 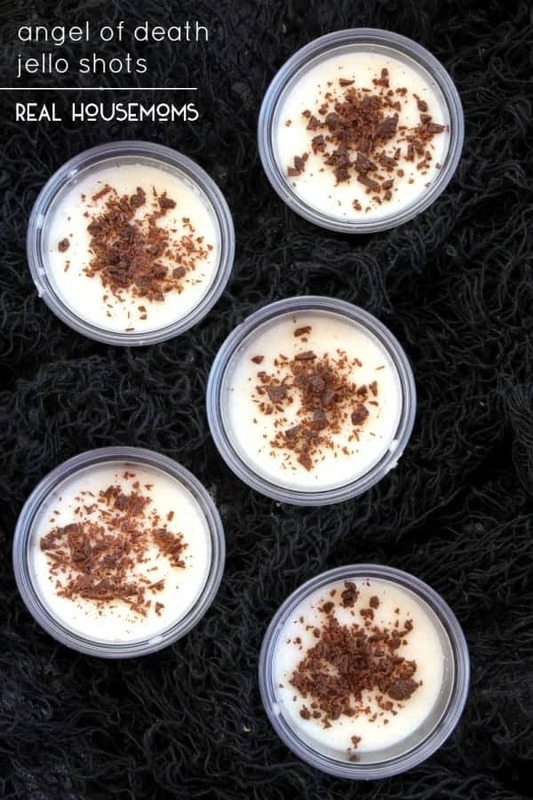 Sprinkle to top of each shot with chocolate shavings. Replace the lids and refrigerate until ready to serve. Need some more Halloween Jello Shots? adult version of jello shots??? I’m in! this is amazing! These shots are soooo good! I made these for the Homecoming Blue Angel show here in Pensacola. Everyone kept asking what they were! I couldn’t find cake vodka, so I just doubled up the whipped cream vodka and they were amazing. I recommend at least doubling this recipe depending on the amount of people (I quadrupled it). They will go fast! This will be my go to recipe for tailgating this Fall. Thanks for this recipe! !